they were bent, but not broken! and look how many! I’ve been slowly building my collection of aloes – so over the couple of months we should see a nice variety of blooms from these amazing plants! The blooms above are from my Aloe arborescens hybrids – I don’t know the exact variety, but they beautiful, single trunked succulents with clear yellow blooms. They remind me of spiders on stilts. Yes, weird. We will be seeing lots of the fabulous and the weird! I am planning a field trip to the Huntington this coming week to dive into the Belly of the Aloe Beast – and you all will see the results! The photo above makes it look like the blossom is coming out of an Agave ‘Blue Glow’ (WOW! Wouldn’t THAT be cool? ), but it is actually coming out of Aloe salm dyckiana, another lovely solitary trunked aloe. I got two of them on a crazy succulent binge one day. I can’t wait to see them, tall and majestic, flanking this small gravel area between my main outdoor seating area and my side porch. A. salm dyckiana, looking mighty fine for a youngster! One of my favorite aloes (WAIT – don’t let me get away with that! How can I possibly say one is my favorite? I have to figure out better superlatives with which to describe these plants, because ‘favorite’ is not true. I love them all) is A. ciliaris hybrid, a mounding, groundcover type that has been extremely useful in my garden – it holds court under Aloe marlothii ‘Willard’ ( I am now trying to name a variety of aloe that I had nothing at all to do with other than falling in love – how appalling is THAT) and does a beautiful job of weaving in and out of other aloes, grasses, and perennials. I started this rather large cluster from 3 cuttings – now it’s a swath about 8ft wide and 3 ft tall. J’ADORE! 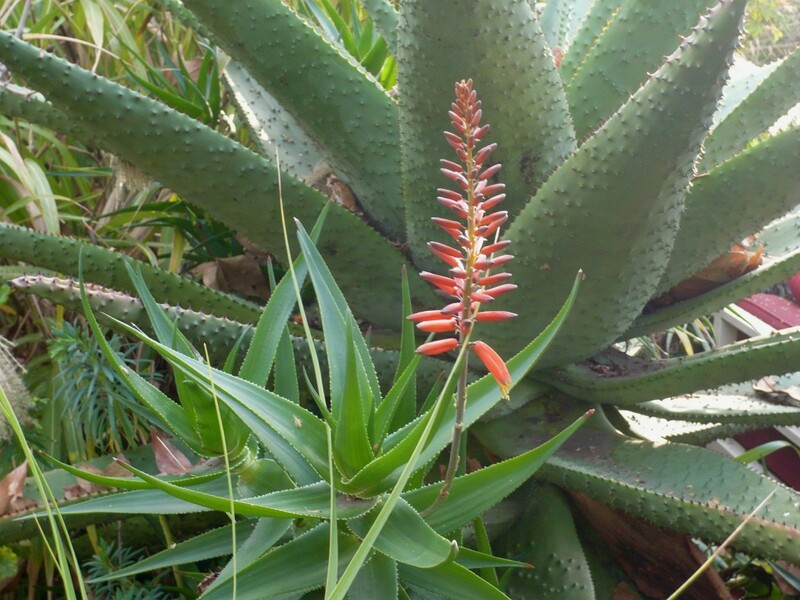 Most of my aloes have unbranched spikes with deep orange/red flowers – the one above, Aloe rubroviolacae, is noted for it’s leaves, which take on a pinkish hue. Mine must not have gotten the memo, because there is not the tiniest blush on its leaves. In fact, it looks an awful lot like another A. salm dyckiana. Mislabeling often occurs in the nursery industry – and when dealing with specialty aloes and agaves it can be hard to tell them apart. But I have no worries, this is how I learn! I’ll let it grow, comparing it to the images in books and online, and to the aloes I know. And, lucky me, I have one of the best resources in the world a few miles away! Get ready for Aloe Extravaganza – The Huntingtion!!! Gorgeous! Your aloes and grasses and sedges are turning me on. Funny your heading back for Huntington for round 2 and I haven’t even posted yet about my visit back in October! Bad Loree! Where does the time go anyway? 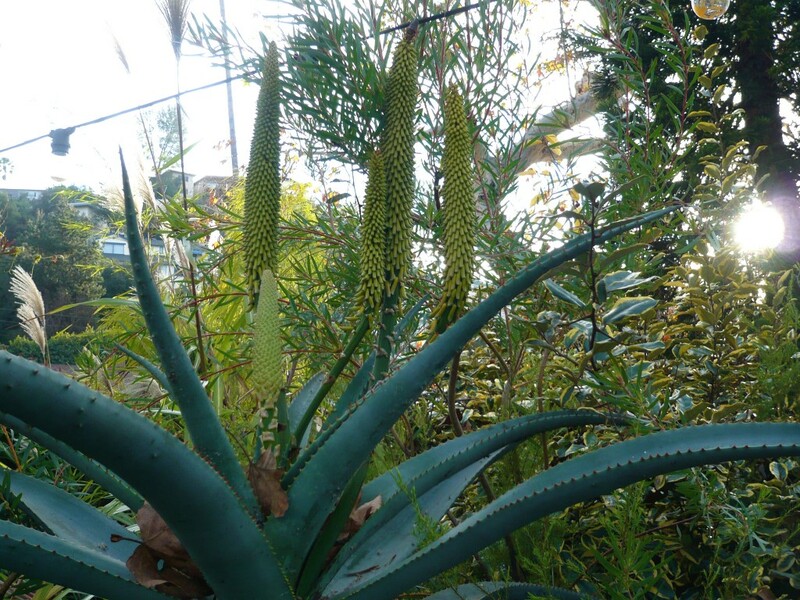 I am very excited to see their aloes in bloom…and yours are spectacular! Once again color me green with envy…. You’ve got to love plants that bloom big and loud when nothing else is going on in the garden. I actually like the last photo best, such a cool pattern with lovely gradations of color. You’ll go nuts at the H’ton—this is the best time of year to see the desert garden…well, now and in June, when the puyas are in bloom. Puyas, which sound like something out of Dr. Doolittle, are plants you definitely don’t want in your garden (leaves like serrated knives), even though their flowers are an otherworldly metallic green and blue. Would love to have you report on them, maybe do a video (Ivette wearing armored boots braves the puya field). I love the color on the Aloe salm dyckiana. I can see why you look forward to this time of year…your garden looks very, (and sticking with the Goldblum theme)… “Jurassic” and vibrant, all these crazy blooms and bold aloe forms. Stunning G! And fuller your winter garden is indeed. (Oh no, Yoda has popped in now). Lovelovelove your aloe!!! fabulous pic.’s! Chuck B – I truly feel like my garden is doing it’s job! It IS all kind of hot, right? I’m very happy to have made something that is turning you on. I’m blushing, actually! Oh, Loree, I KNOW how it is! But I can’t get my mind out of the aloe gutter, with the blossoms firing off all around me. You get to have the great ‘gardening time out’ that winter gives those further north – I’d be doing other things, too! But I CAN’T WAIT to see what the Huntington looks like through DANGEROUS eyes! Debra! I get SO thrilled when you comment – my guru! 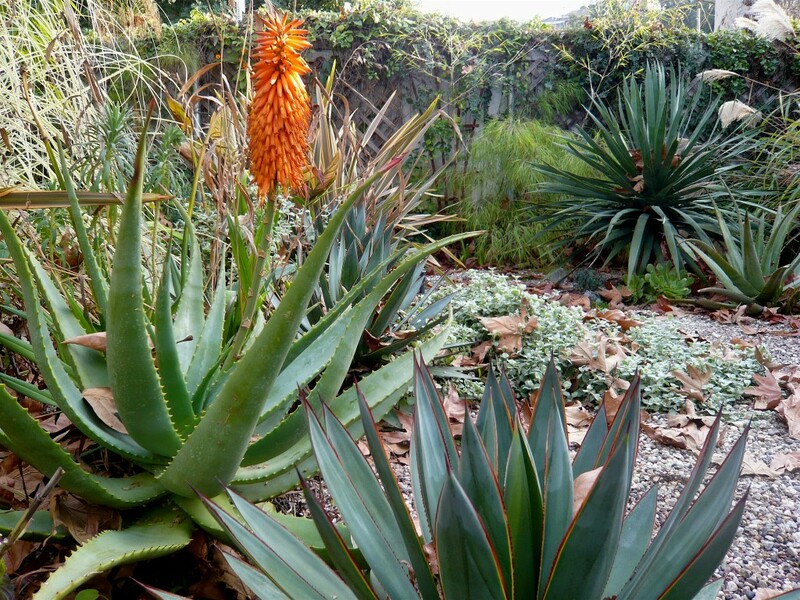 I agree with you totally – I added aloes to my garden to really get a big winter. I am sheepishly confessing that this is the first time I’ll be at the Huntington during peak aloe bloom, and I’m chomping at the bit! 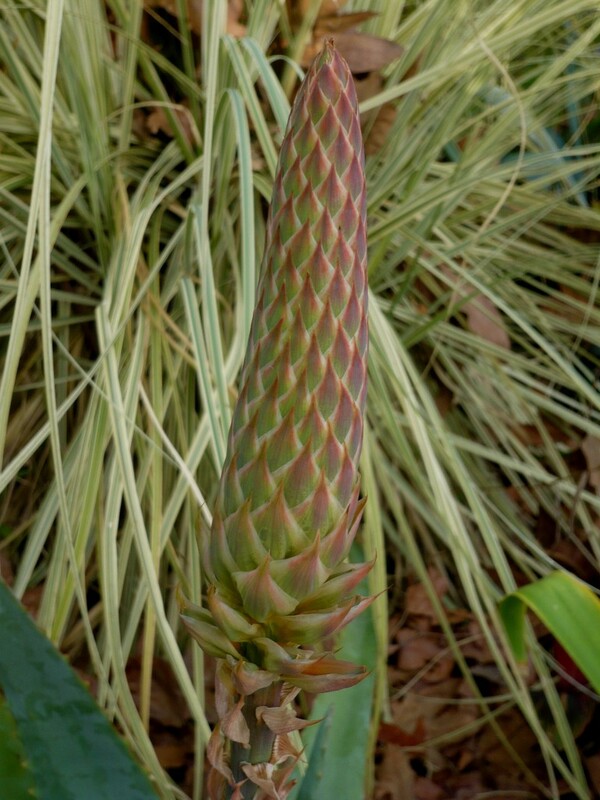 I also LOVE the last photo – the tightly closed bud of what may or may not be Aloe rubroviolacea. I want a dress made out of that pattern! Okay, I’m going to have to give you a shout out when I do the puya video – and I’ve already got my army boots! XO! ESP, this is going to be FUN! I can’t wait until Friday. I might have to go break in right now and careen around from aloe to aloe like a madwoman with a flashlight. You do not know that you have given me the biggest compliment anyone could give. To call my garden “Jurassic” (and in a Jeff Goldblum accent no less) is such high praise I may faint. I have an image of what I want my garden to look like in years to come, and the words that most often come to mind are “prehistoric”, “jurassic” and “dinosaurean” (which I know is not a word, spellcheck, calm down). And I can see it sometimes, the beginnings of it. So THANKS ever so for seeing that and pointing it out, and bringing Jeff and Yoda to the party! Always fun to chat w/ you, E! Hi Dirty Girl – You can love my Aloe ANYTIME! 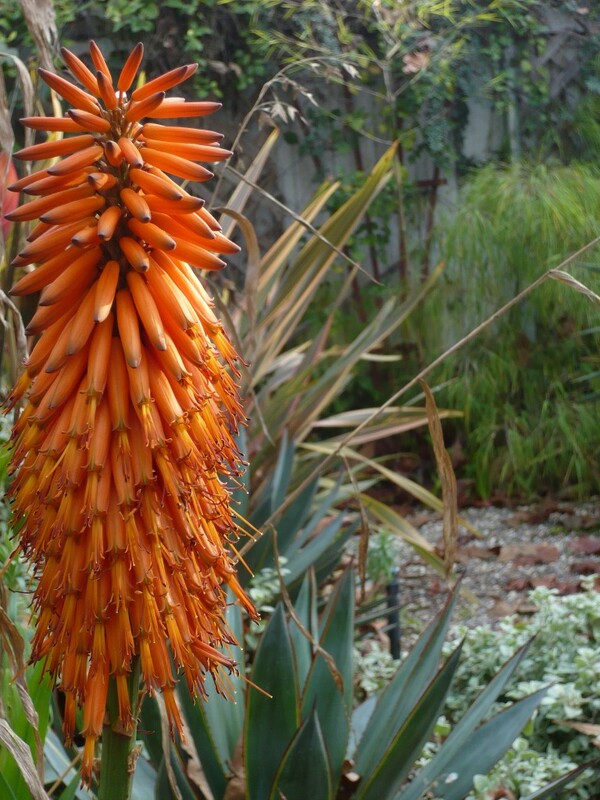 the essence of winter in California… the miraculous, magical, magnificent bloom of an aloe! ALOES!!!! Gorgeous pics! I just can’t enough of flowering aloes. Yay! I’m so glad the deluge did not ruin the show and leave with you with a pile of stinking horns but no aloe flowers! Beautiful! After looking at your own garden, you’ll have a hint of what to expect tomorrow at The Huntington….lots of aloes in bloom there. It was so pretty to see masses of them all blooming!